Rain. Lots of it. 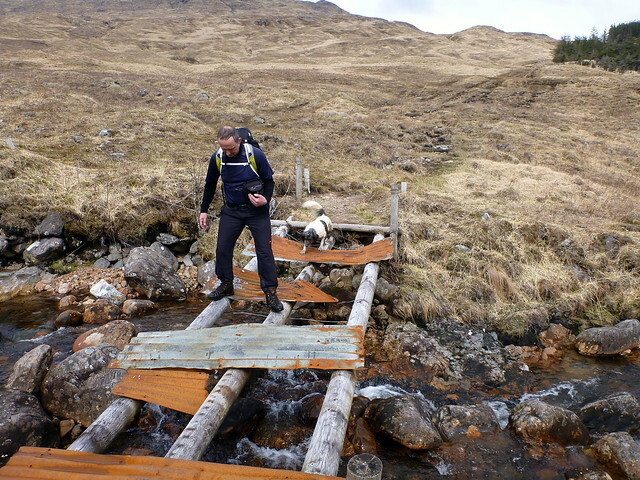 This weekend's plan was a trip to Glen Etive with a coda in Glen Dochart. 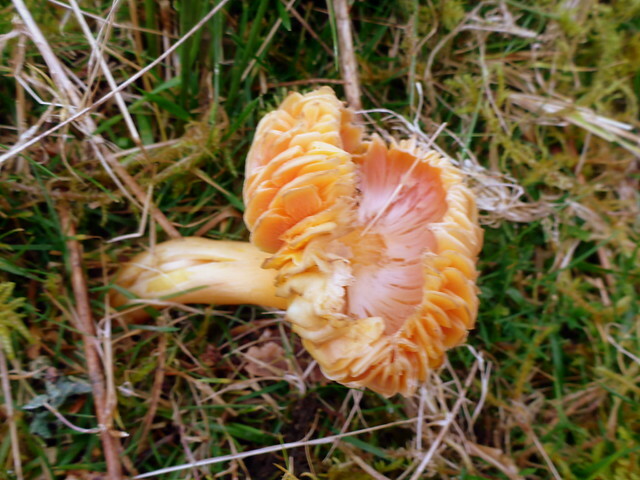 Once again the forecast was for rain and wind, frustrating after a pretty reasonable spell during the week. With the nights drawing in we made it up to the northern end of the glen as the light was fading - a reminder that very soon we'll be arriving in the dark, always stressful if you haven't a clear plan where to camp. 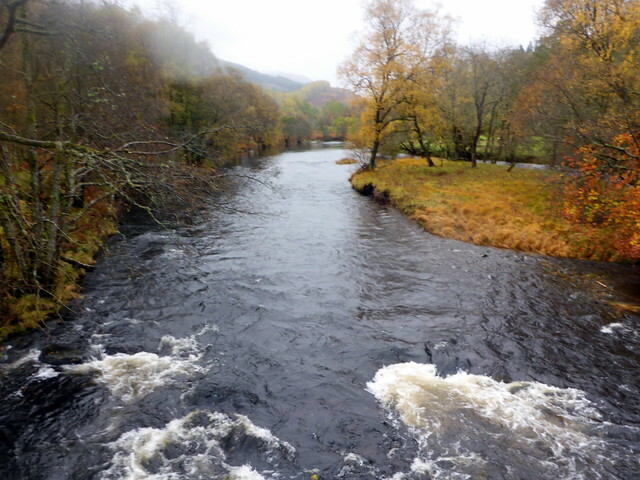 Anyway, we chose a spot that was clearly popular with the masses during the summer, going by the well-worn path from the layby to a serviceable plot beside the river. 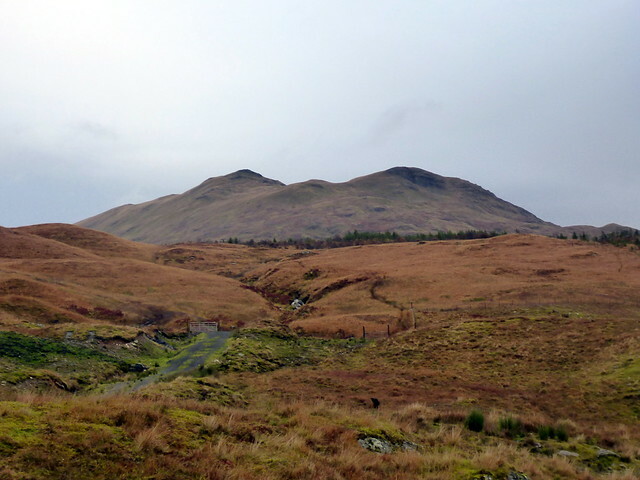 Very little traffic passed during the evening, the glen quiet apart from the roar of stags on the hillsides. 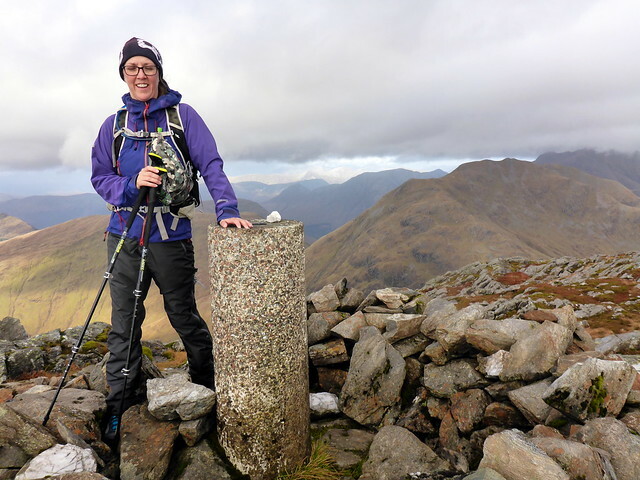 Allison needed Beinn Fionnlaidh for her numbers - I decided we should tag on Sgor na h-Ulaidh and the Simm/Hump of Meall a'Bhuiridh. I don't think she was especially thankful for that idea. 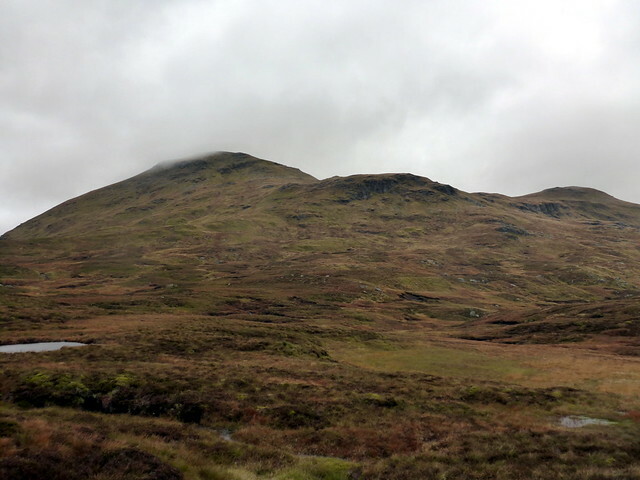 We parked at Invercharnan and set off through the (largely cleared) forest. 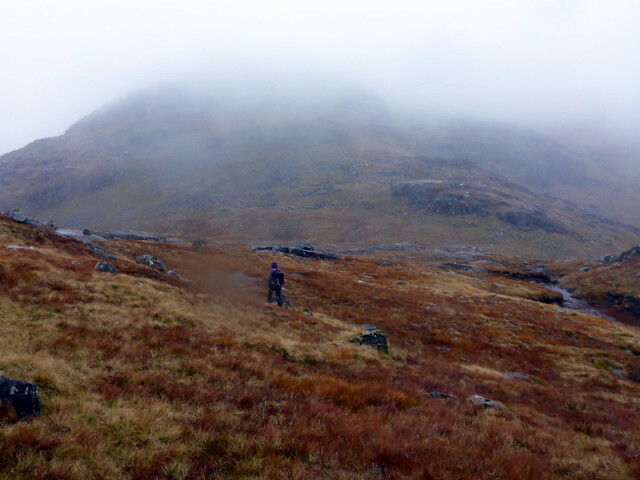 Arriving at the edge of the tree-line we turned up to the right, following an ATV track initially onto Meall a'Bhuiridh. 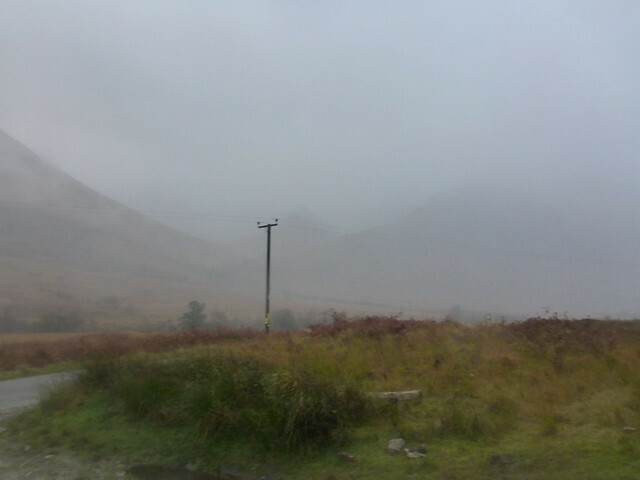 Clag down to around 400m, drizzle in place - yeah. 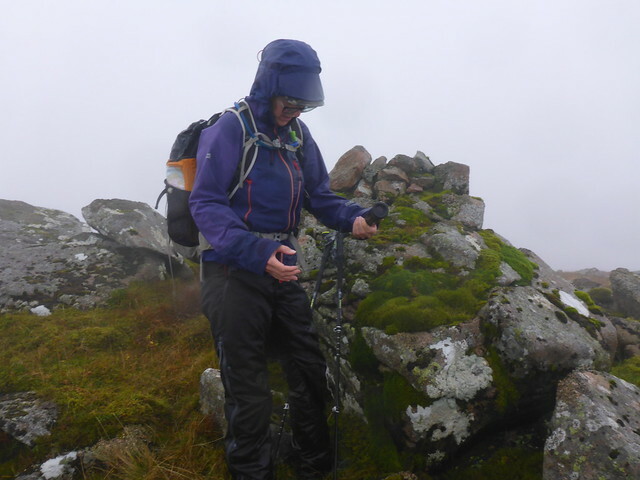 Picked up a very wet monocular someone had left on the cairn. 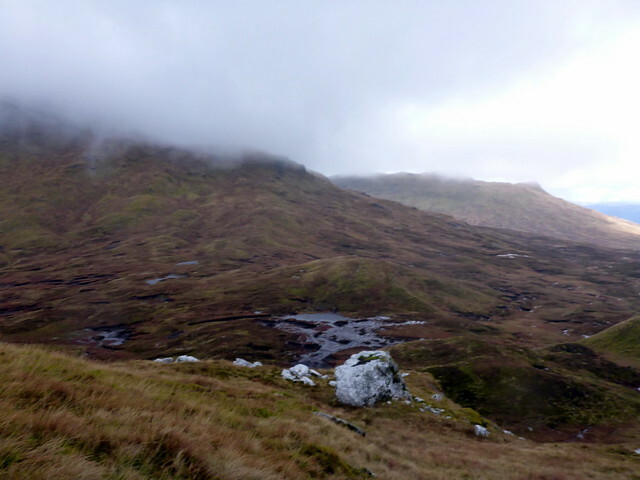 We continued northwest to the bealach (of the robber's stone) and prepared to make our way up Ulaidh. 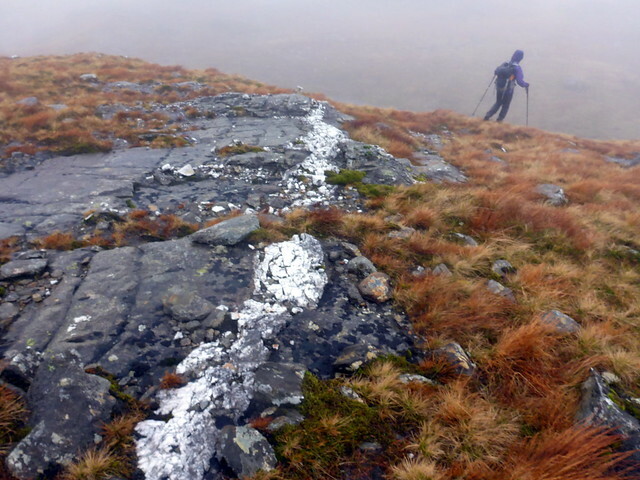 There seemed to be quite a lot of crag bands, and visibility was compromised by clag. However we found a path winding up alongside a line of fence posts - having climbed this mountain now from three different approaches I can confidently say this is the easiest and most pleasant. 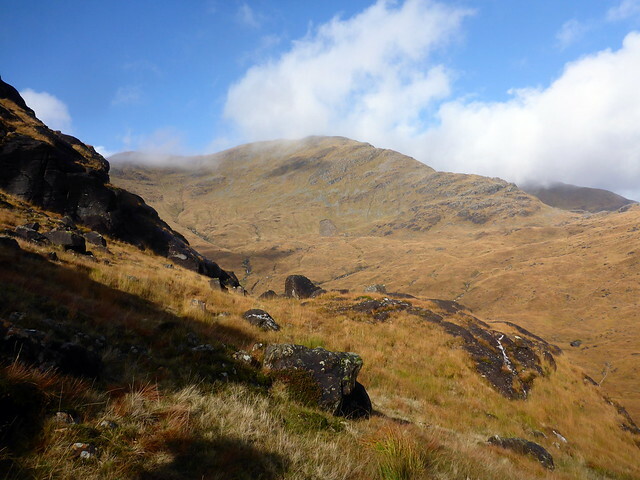 On reaching the summit my plan had been to continue high to Corr na Beinne and drop down its southern shoulder, but given the lack of visibility and high windspeed I felt it prudent to retrace our steps and take a lower level linking route to Fionnlaidh. We continued along the fenceline on soaking wet grass - here I managed to slip and land flat on my back. 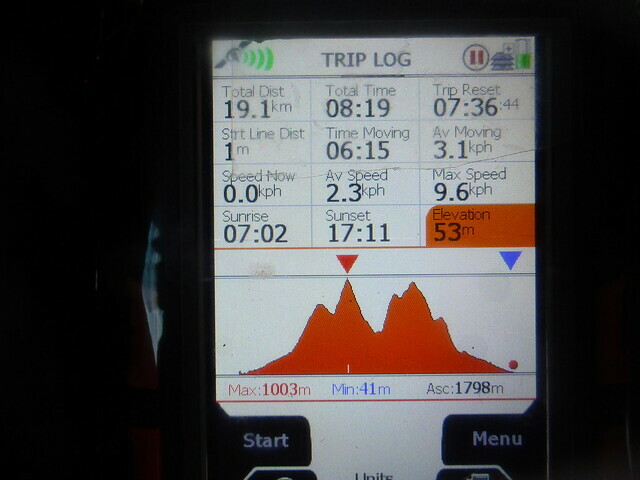 Or what would have been flat on my back had I not been wearing a rucksack. Instead, it was more like a turtle being plonked down on its convex shell - my neck hyperextended back and although my head didn't hit the ground I did get a jolt and felt mildly concussed. Basically, whiplash. I can only remember falling like this once before, it's not pleasant. 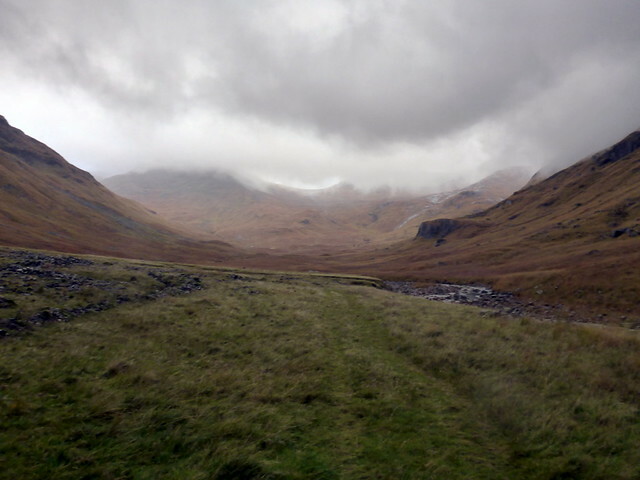 We continued towards Fionnlaidh. 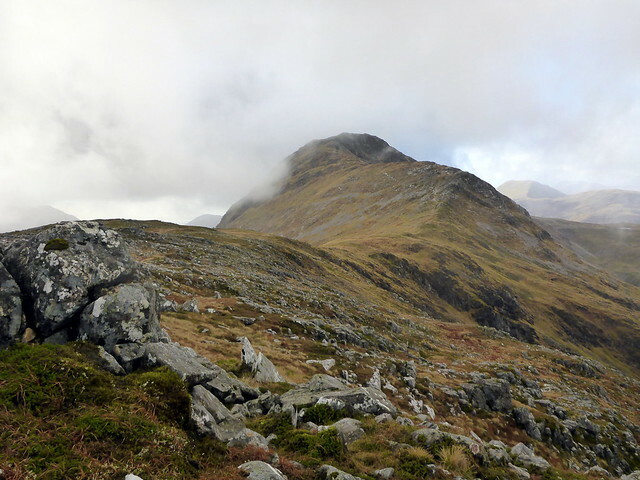 My original plan had been to head up Coire Reidh to reach the 841m top but as we were coming from a different direction now, a change of approach seemed sensible. 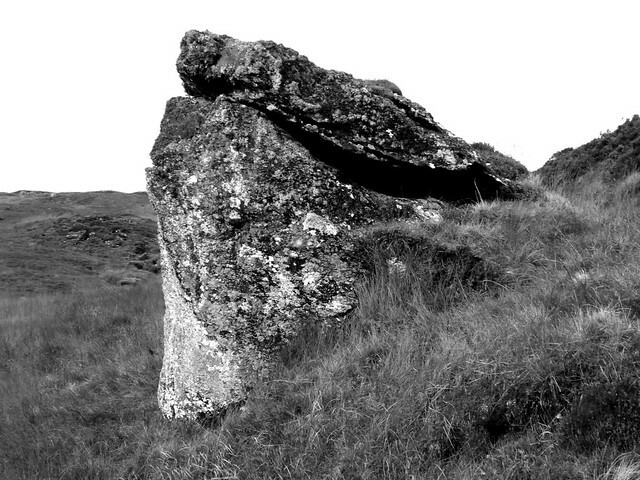 Not up the craggy nose, maybe just to the south of that. 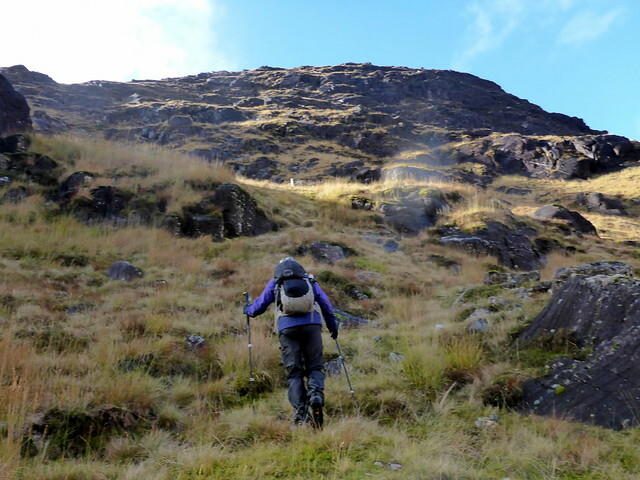 Although quite steep there proved no impediment to this ascent route and we gained the crest of the ridge. From here it was simply a matter of continuing along the back of the mountain to reach the summit - a couple of little scrambly bits on the way. 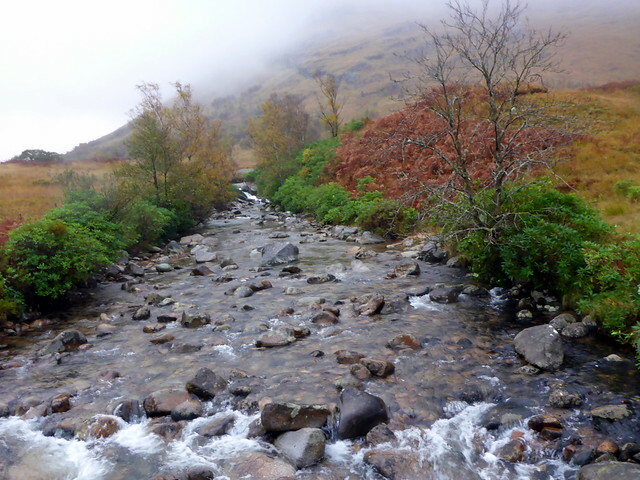 Good views of the surrounding mountains, particularly those in Glencoe now that the sun had appeared. 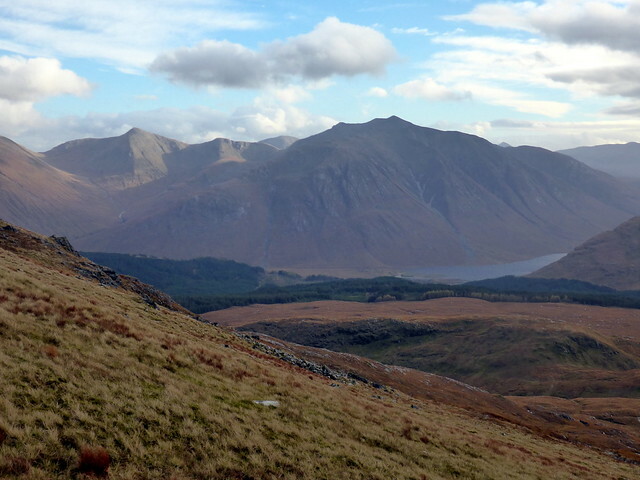 To the south lay the glistening slabs of Beinn Trillichean and Loch Etive beyond. 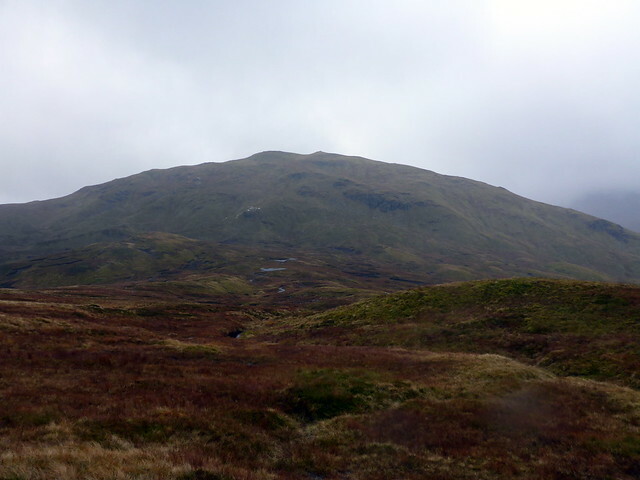 Our descent was to be down the southern flank of Fionnlaidh, following a fenceline then contouring round to Meall nan Gobhar before picking up a path and heading back to the forest track. I was pleased to see the rickety old bridge has been replaced with something more substantial. Good view of Starav as we returned to the car. I wondered where we'd pitch for the night - I didn't fancy the spot at the head of the loch which tends to be busy with tents and campervans. Drove round to what would be the start of tomorrow's hills and found there was enough flat ground to pitch behind the parking place. That'll do. 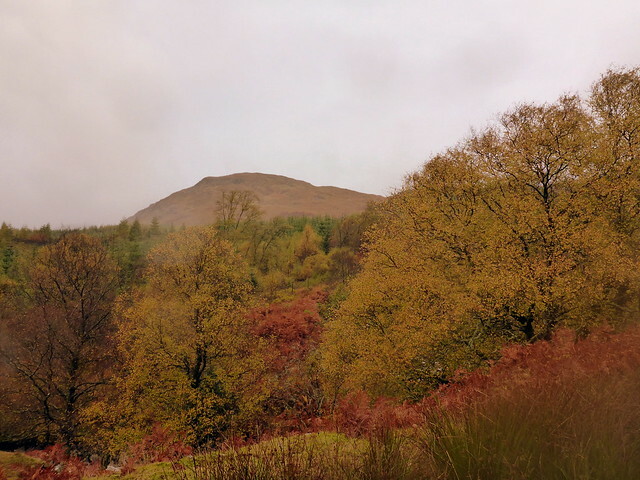 A very bright moon floodlit the glen until around midnight when the clag descended and the rain began. 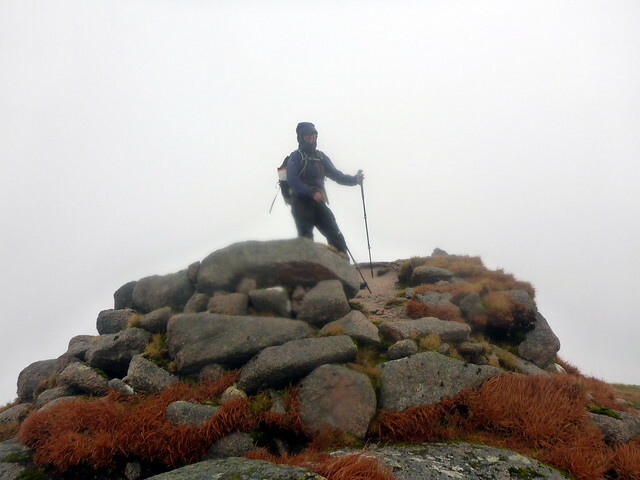 Meall nan Eun and Stob Coir an Albannaich were on the menu for Saturday. 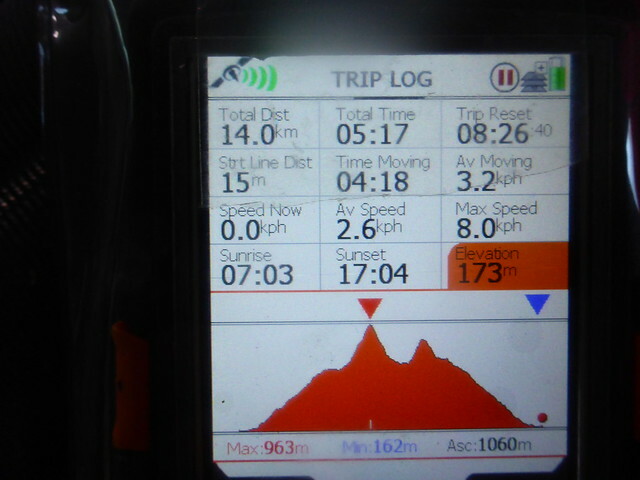 I'd previously done these (twice) as part of an anticlockwise circuit of the Starav five and had abiding memories of an awful descent down Glen Ceitlein on tired legs. 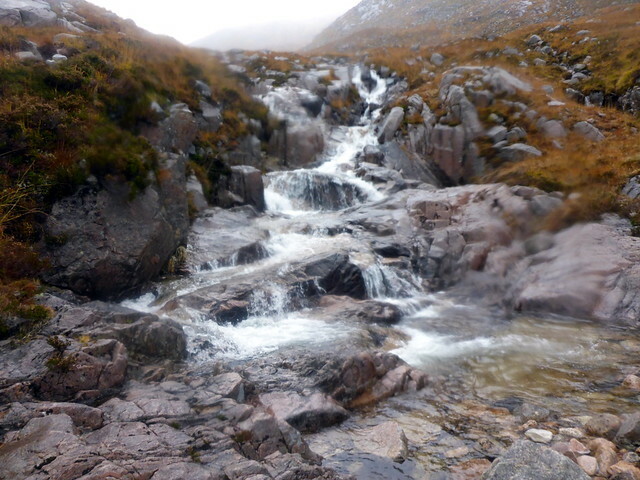 Today we'd reverse that route, head up Ceitlein and descend along the Allt Mheuran, maybe adding in Glas Bheinn Mhor. Neither of us had any energy - maybe a result of my whiplash as far as I was concerned. 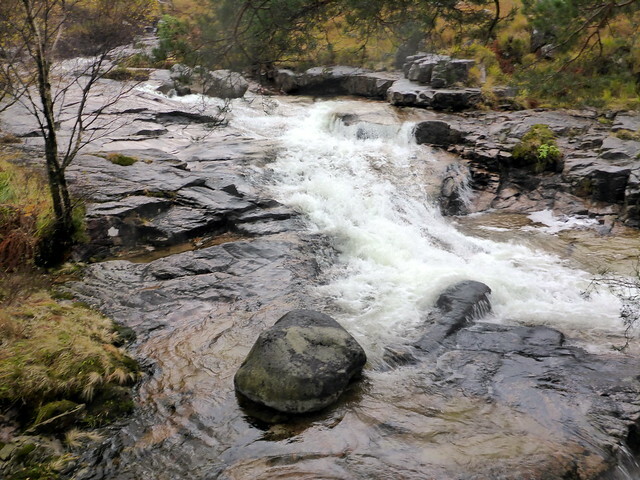 We were also sheltered from the wind and it seemed oppressively hot and clammy in our waterproofs. 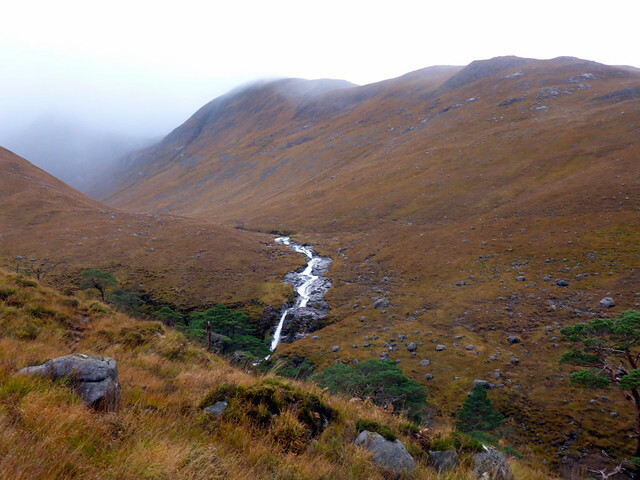 We plodded grimly through the mirk and mud, gaining height slowly as we headed up the glen. 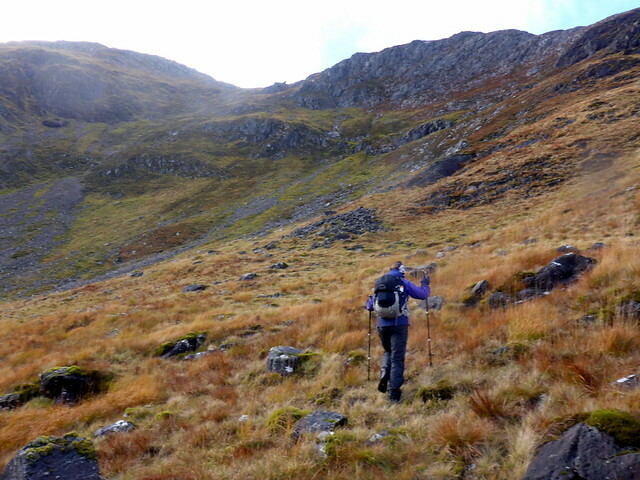 Somewhere we lost the track, such as it is and meandered around in Lairig Dhochard looking for a way up the foothills of Meall nan Eun. 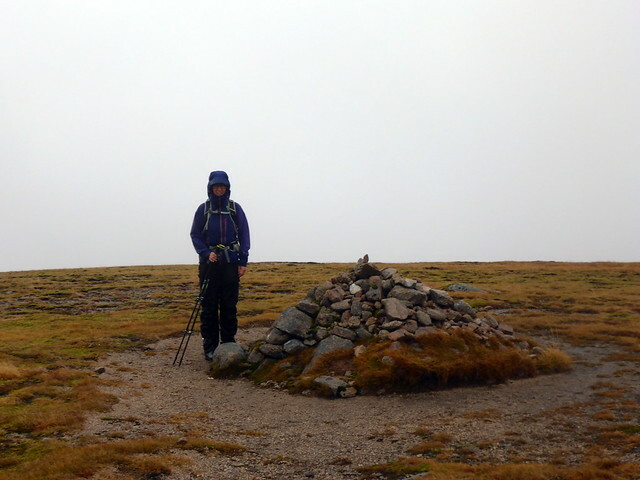 Reunited, eventually, with the path, we reached the summit - blustery and chill where exposed to the wind and rain. 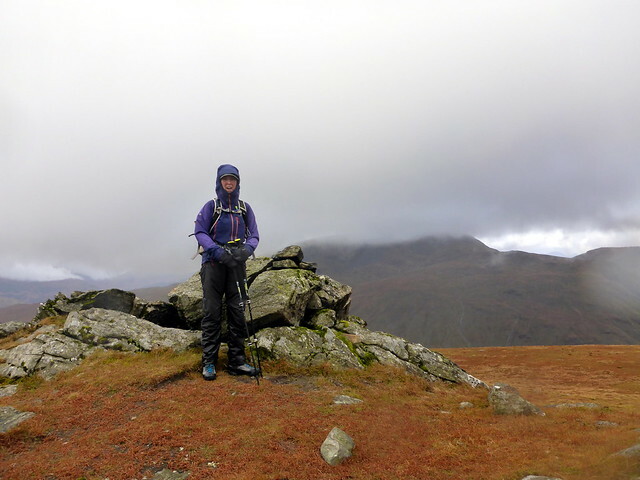 No places to shelter for lunch, we pressed on towards Meall Tarsuinn where we did find some shelter. 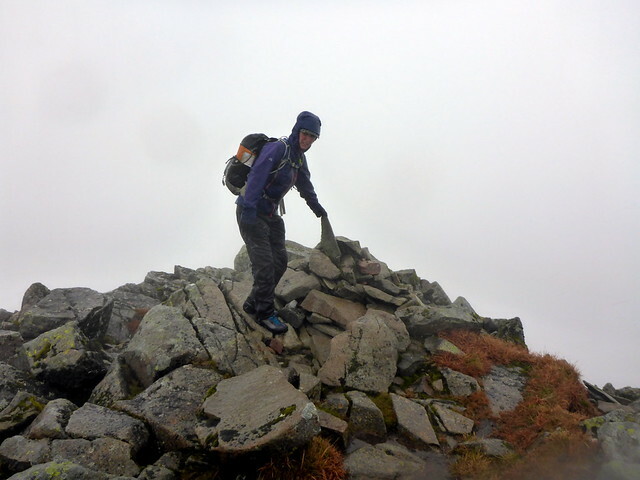 The rain and clag didn't let up as we made our way up to Stob an Coir Albannaich - a steep and sharp-edged climb to the summit. 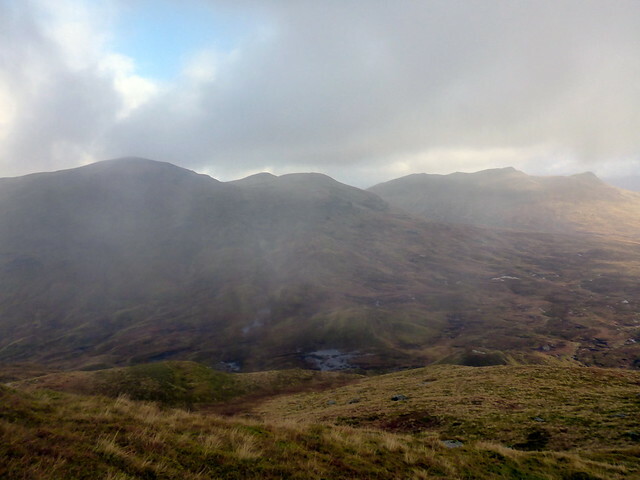 Wandering from there to the bealach with Glas Bheinn Mhor was a maze of bog and mist - glad when the clag finally lifted enough to see where we were supposed to be going. 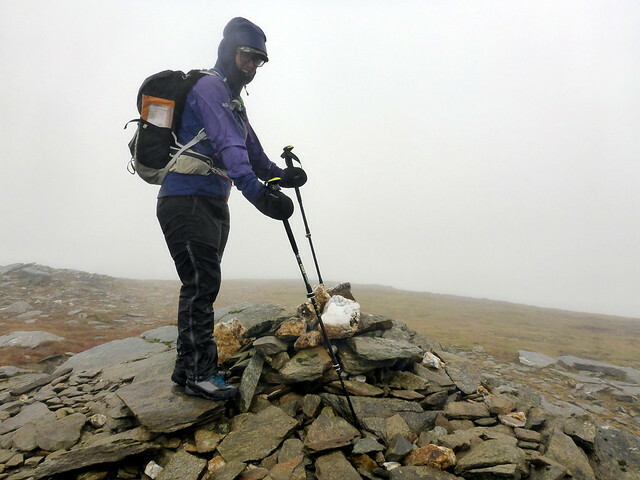 Plans to include the third Munro summit had evaporated in the relentless rain - it had taken longer than expected already, due most likely to our shared zombie state. 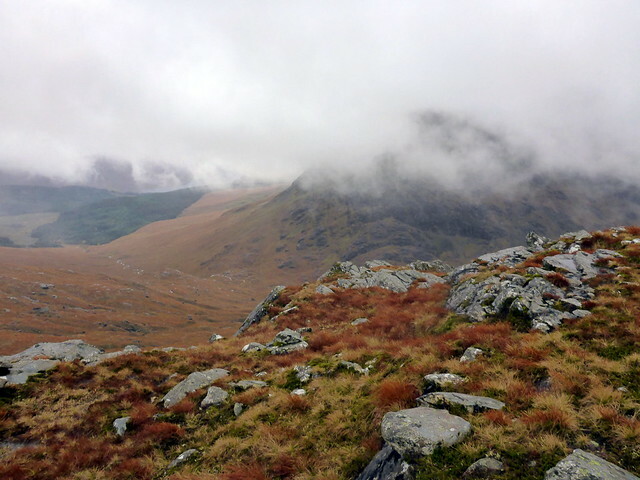 So we began the traipse down the valley, knowing that the "field of bog" awaited us at the bottom. 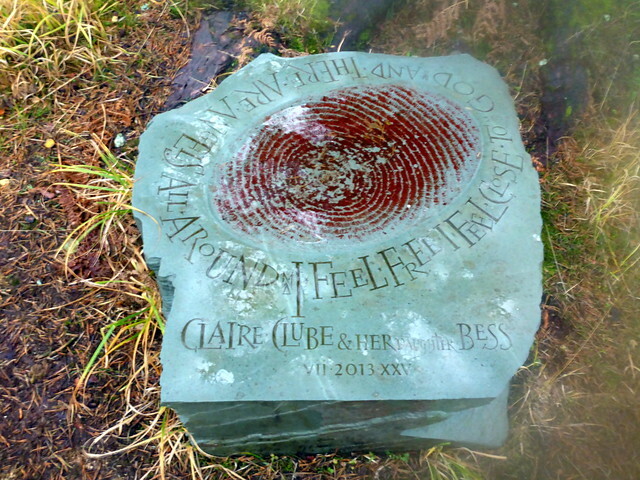 Passing along by the river near the deer-fence we happened upon a rather beautiful memorial stone to Clare Clube and her daughter (later, Google told me she'd been an American poet who'd died in a plane crash in Nairobi, the quote on the stone taken from the text she sent her husband 10 minutes before she was killed). Quite some feat to haul a huge lump of marble up to where it sits. We managed to traverse the field of bog and returned to the car. I'd left the tent in place - always a bit risky when near a road, but with the weather being foul I guessed there'd be little passing traffic. And indeed all was intact - relief at not having to pitch in the rain, we could just crawl inside and make a start on the tea. An uncomfortable night - the rain never stopped and I couldn't get comfortable due to my sore neck. 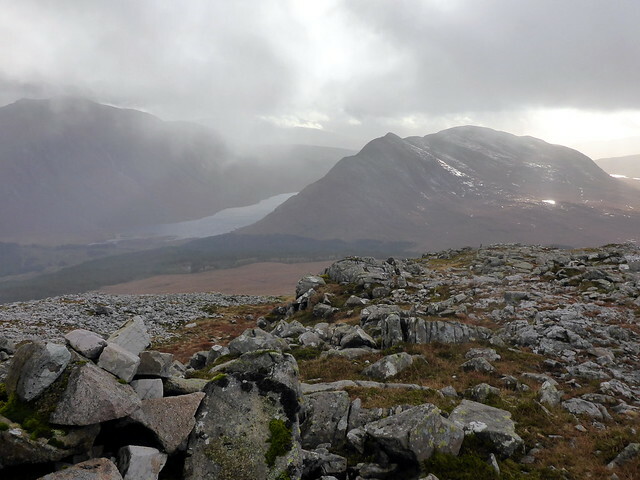 I don't know, some folk are just fair weather walkers, can't see much to complain about! Seriously, wonderful perseverance, well done, and I like the 'alternate' routes. Or a touch of madness perhaps, better still? I saw that memorial last year, the letters hadn't been painted, so hard to read. Thanks for the information, I had meant to research but clean forgot. Now you've put the kybosh on it saying that, maybe you should let folk know where you're planning to go so they can go elsewhere! 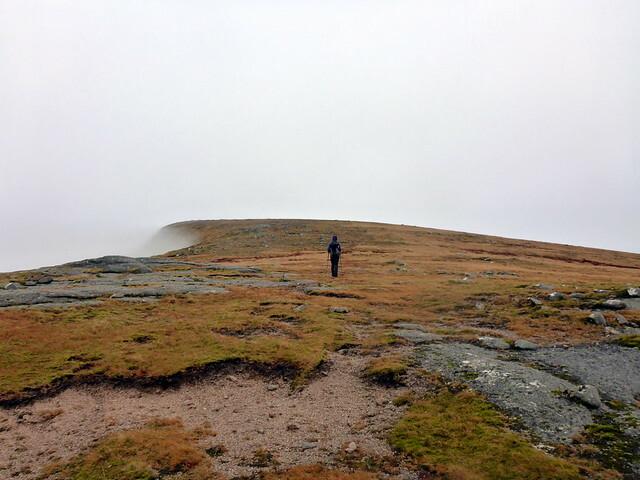 yokehead wrote: I don't know, some folk are just fair weather walkers, can't see much to complain about! Seriously, wonderful perseverance, well done, and I like the 'alternate' routes. Or a touch of madness perhaps, better still?